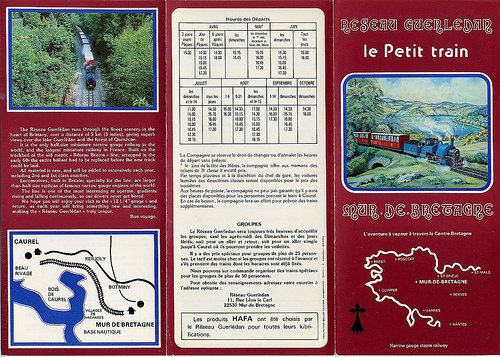 Very short-lived operating between 1978 and 1979, the Réseau Guerlédan Railway was a 3-mile-length of narrow-gauge railway at 12.25″ gauge between the town of Mûr-de-Bretagne and the small village of Caurel. Our family bought the section of abandoned metre-gauge track and the station buildings where my father, John, commenced work on the new track and reconstruction of the existing infrastructure. I was only 10 at the time and have many fond memories of spending a couple of summer vacations there. The engine, France (later renamed Sherpa), was the very first piece of machinery I drove. I was allowed to drive France solo halfway up the line and back. Not sure how comfortable I would feel letting a 10-year-old loose on a steam engine! The line, itself, was remarkably beautiful running through meadows and deciduous forests along with the occasional lake view. It was a fairly challenging run with some quite steep inclines along some of its length of track. The new home for the locos from the 80’s on at the Fairbourne Railway posed little in the way of challenging hills and inclines but the sand blown from the nearby beach was a big issue! This collection of photos (converted from slides taken by my father) has never been published save for a few which I posted on one of the Fairbourne Railway group pages. Due to its short longevity, there is scant material available about this little-known railway. The locos and rolling stock were out of use for a few years when the railway closed but were transported to the Fairbourne Railway, which our family acquired later in 1983. As the rolling stock and engines were all 12.25″, it made sense to regauge the Fairbourne Railway from 15″ to 12.25″, although this created some discordance with some of the Fairbourne Railway community. Much of the history of this railway is shrouded in mystery with a number of unfounded rumours and myths about me being kidnapped resulting in the closure of the railway. It’s a peculiar thought that all the engines which we built or had built for us will probably remain in operation long after I pass away. France and Jubilee (now Sherpa and Yeo respectively) are lovingly taken care of to this very day by a series of new owners and an army of enthusiastic volunteers since we sold the Fairbourne Railway in 1995. Elaine (now Russell) and David Curwen (now Beddgelert) are still with the Fairbourne Railway although they seem to spend a considerable amount of time in the workshop. The big American engine which the Fairbourne Railway built from stratch, Number 24, was sold to another tourist railway and is still operating with great success today.